Labels are the main method of placing non-editable text in windows, for instance to place a title next to a Gtk.Entry widget. You can specify the text in the constructor, or later with the Gtk.Label.set_text() or Gtk.Label.set_markup() methods. The width of the label will be adjusted automatically. You can produce multi-line labels by putting line breaks (“\n”) in the label string. 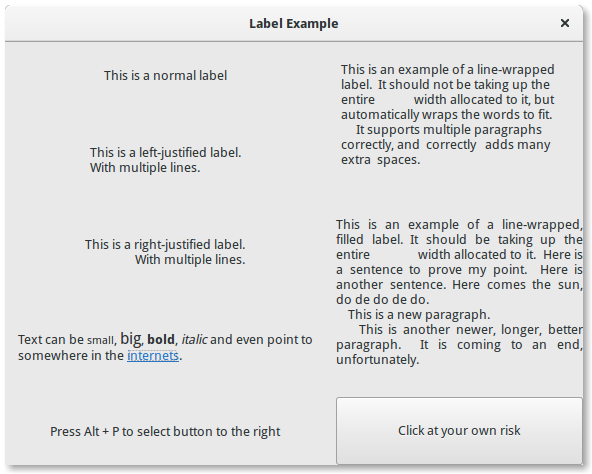 The label text can be justified using the Gtk.Label.set_justify() method. The widget is also capable of word-wrapping, which can be activated with Gtk.Label.set_line_wrap(). Gtk.Label support some simple formatting, for instance allowing you to make some text bold, colored, or larger. You can do this by providing a string to Gtk.Label.set_markup(), using the Pango Markup syntax . For instance, <b>bold text</b> and <s>strikethrough text</s>. In addition, Gtk.Label supports clickable hyperlinks. The markup for links is borrowed from HTML, using the a with href and title attributes. GTK+ renders links similar to the way they appear in web browsers, with colored, underlined text. The title attribute is displayed as a tooltip on the link. label.set_markup("Go to <a href=\"http://www.gtk.org\" "
Labels may contain mnemonics. Mnemonics are underlined characters in the label, used for keyboard navigation. Mnemonics are created by providing a string with an underscore before the mnemonic character, such as “_File”, to the functions Gtk.Label.new_with_mnemonic() or Gtk.Label.set_text_with_mnemonic(). Mnemonics automatically activate any activatable widget the label is inside, such as a Gtk.Button; if the label is not inside the mnemonic’s target widget, you have to tell the label about the target using Gtk.Label.set_mnemonic_widget(). label = Gtk.Label("This is an example of a line-wrapped label. It "
"should not be taking up the entire             "
"width allocated to it, but automatically "
"wraps the words to fit.\n"
"     It supports multiple paragraphs correctly, "
label = Gtk.Label("This is an example of a line-wrapped, filled label. " "It should be taking "
"up the entire              width allocated to it.  " "Here is a sentence to prove "
"my point. Here is another sentence. " "Here comes the sun, do de do de do.\n"
"    This is a new paragraph.\n"
"    This is another newer, longer, better "
"paragraph. It is coming to an end, "
label.set_markup("Text can be <small>small</small>, <big>big</big>, "
"<b>bold</b>, <i>italic</i> and even point to "
"somewhere in the <a href=\"http://www.gtk.org\" "